Edit the markdown source for "frameworks-using-less"
Ant Design An enterprise-class UI design language and React-based implementation. Edit the markdown source for "editors-and-plugins"
Edit the markdown source for "plugins"
Edit the markdown source for "guis-for-less"
Tip: try out the different Less tools available for your platform to see which one meets your needs. This page focuses on GUI compilers. For command line usage and tools see Command Line Usage. The editor and compiler for awesome people. Crunch 2 is a cross-platform (Windows, Mac, and Linux) editor with integrated compiling. If you work with large Less projects, you should definitely try it out, as you only need the free version for Less files. Available at: https://getcrunch.co/. SimpLess is a minimalistic Less compiler. Just drag, drop and compile. 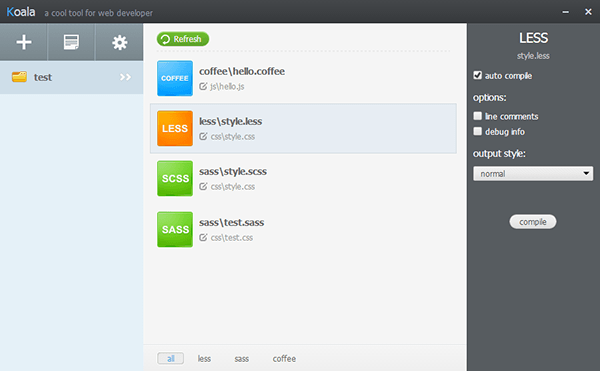 Koala is a cross-platform GUI application for compiling less, sass and coffeescript. Features: cross platform, compile error notification supports and compile options supports. Prepros is a tool to compile Less, Sass, Compass, Stylus, Jade and much more. WinLess started out as a clone of Less.app, it takes a more feature-complete approach and has several settings. It also supports starting with command line arguments. CodeKit is the successor to LESS.app, and supports Less among many other preprocessing languages, such as SASS, Jade, Markdown, and many more. 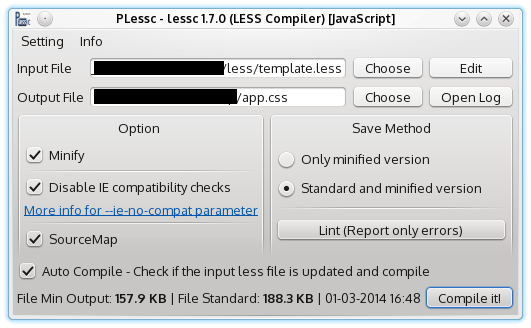 Plessc is a gui fronted made with PyQT. Edit the markdown source for "online-less-compilers"
less2css.org Online Integrated Development Environment (IDE) that is hosted in a browser allowing users to edit and compile Less to CSS in real-time. winless.org/online-less-compiler This Online Less Compiler can help you to learn Less. You can go through the examples below or try your own Less code. lesstester.com Online compiler for Less CSS. 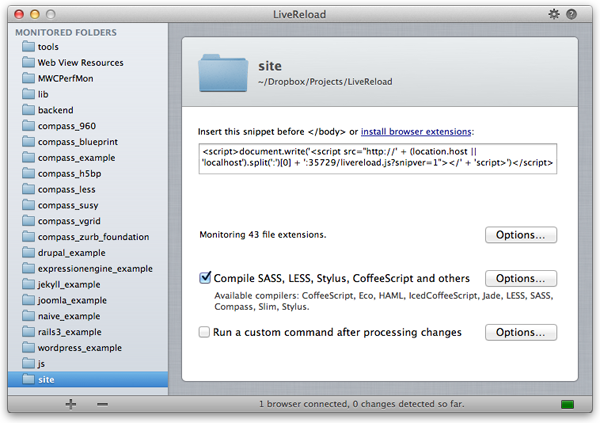 estFiddle Online Less compiler providing live demo for Less and est. 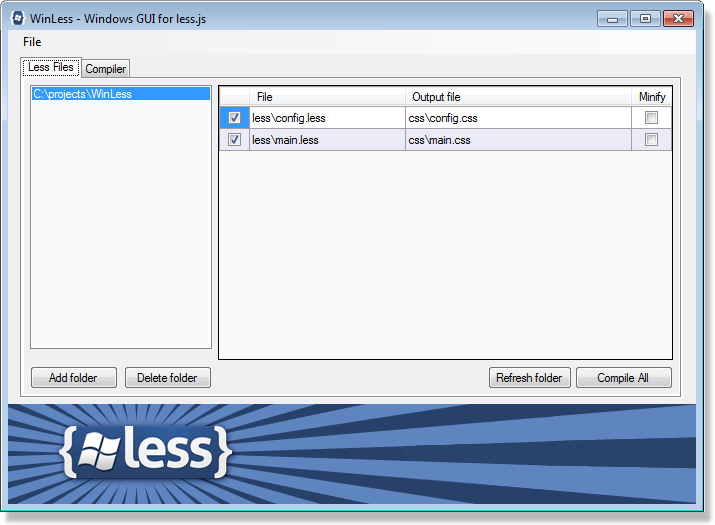 Allowing users to switch among all versions of Less after 1.4.0 with optional est/Autoprefixer functionalities. CSSDeck Labs CSSDeck Labs is a place where you can quickly create some experiments (or testcases) that involves HTML, CSS, JS code. CodePen CodePen is a playground for the front end side of the web. Fiddle Salad An online playground with an instantly ready coding environment. Edit the markdown source for "third-party-compilers"
gulp-less: Please note that this plugin discards source-map options, opting to instead using the gulp-sourcemaps library. autoless: A Less files watcher, with dependency tracking (changes to imported files cause other files to be updated too) and growl notifications. Note - the official Less node runs on windows, so we are not sure why you would use this. Edit the markdown source for "ports"
Know of another port that should be added to this list? Please let us know.